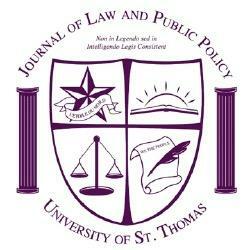 The University of St. Thomas Journal of Law & Public Policy was founded in 2006 by two students with the goal of providing a forum for the critical examination of issues from a conservative and Catholic perspective. In the years since its founding, the Journal has grown in membership and changed in form, but the commitment to advancing the ideals of the St. Thomas School of Law and exploring conservative and Catholic legal thought has remained. Each year the symposia topics are selected by the Journal’s editorial board and approved by the faculty advisors. For the 2016-2017 academic year, the faculty committee is composed of Teresa Collett, Robert Delahunty, Michael Stokes Paulsen, and Charles Reid. In 2015, the Journal moved to an online only publication format. The articles the Journal publishes are available at no cost on this webpage and will continue to be published on subscription based research databases.